Beaton is best known for his fashion photographs and society portraits. He worked as a staff photographer for Vanity Fair and Vogue in addition to photographing celebrities in Hollywood. He became one of Britain's leading war photographers, best known for his images of the damage done by the German blitz. His style sharpened and his range broadened, Beaton's career was restored by the war. After the war, Beaton tackled the Broadway stage, designing sets, costumes, and lighting for a 1946 revival of Lady Windermere's Fan, in which he also acted. Photograph, Bühnenbildner und Graphiker (1904–1980). Eigenh. Brief mit U. („Cecil“). Broadchalke, Reddish House. 2 SS. 8vo. 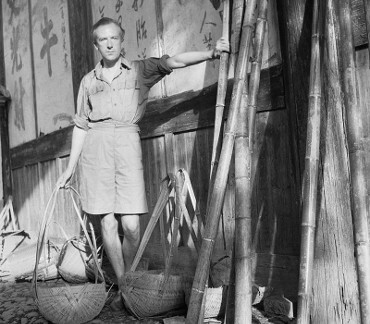 Sir Cecil Beaton (1904–1980), Photograph, Bühnenbildner und Graphiker. E. Brief mit U. („Cecil“). Broadchalke, Reddish House, [4. Dezember 1953]. 2 SS. 8°. – An einen Freund mit Dank für ein Geschenk: „[…] Growing old is so horrible in any case there should be more & more paliatives – & present giving should be more & more encouraged. Thank you for letting me have such a nice silver surprise [...]“. – Beaton gilt als der bedeutendste britische Photograph des 20. Jahrhunderts. 1937 wurde er Hofphotograph der Königsfamilie. – Auf Briefpapier mit gedr. Adresse; mit wohl a. d. Hand des Empfängers stammendem Vermerk samt Datierung in Bleistift am oberen Rand der Recto-Seite..
was an English fashion, portrait and war photographer (1904-1980). Autograph letter signed. Cairo. 8vo. 2 pages. 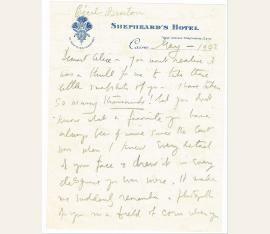 Shepheard’s Hotel letterhead. Pencil. 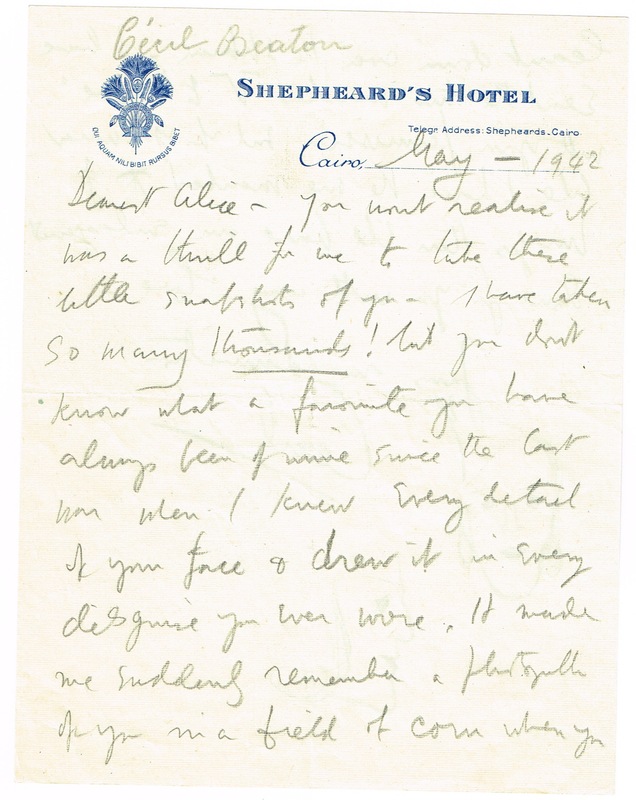 Letter to model Alice. In part: “You won’t realize it was a thrill for me to take these little snapshots of you. I have taken so many thousands! But you don’t know what a favorite you have always been of mine…when I knew every detail of your face & drew it in every disguise you ever wore. 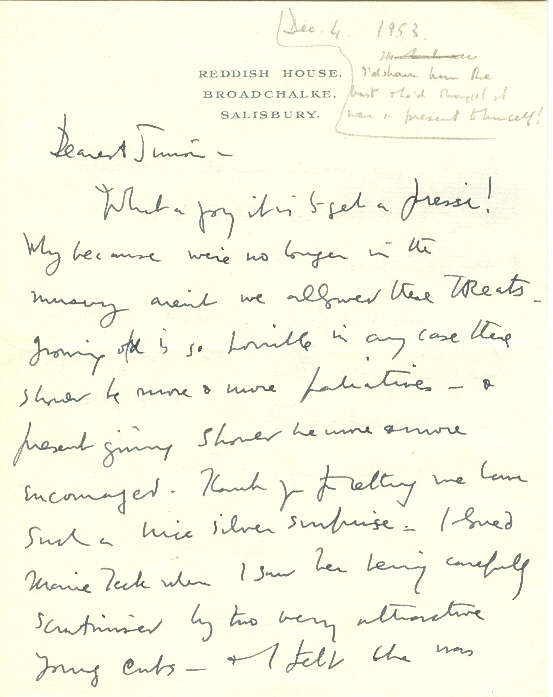 It made me suddenly remember a photograph of you in a field of corn […] I have sent the two marked V to ‘Vogue’”. - Under his signature, Beaton has added two sketches of a female face. - In fine condition, with central horizontal and vertical folds, both passing through small portions of signature, and some light creasing. The first original art we have seen from the award-winning photographer..
3 autograph letters signed ("Cecil"). To the American film director George Cukor (1899-1983) whom Beaton met in the 1930s, and most famously worked with him on the 1964 musical "My Fair Lady" for which Beaton won an Academy Award for Best Art Direction and Costume Design. 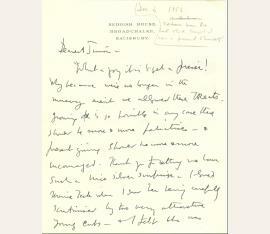 The earliest letter to Cukor reveals Beaton's desire to work in Hollywood and even gives a short resume of his theatrical work; the latest letter to Cukor is written at the end of Beaton's work on "My Fair Lady", and references the trouble on the set: "My contract expires next Friday. I am hoping that Mrs. Higgins' set will be finished in a very few days. Is there anything else you would like me to do as I am quite anxious to get back to where I belong - particularly in view of the unhappiness of the last weeks. I would like to thank you for all the brunches & entertainment at your house & for the many kindnesses you showed me until things went wrong between us [...]". - From the Estate of Charles Williamson and Tucker Fleming. 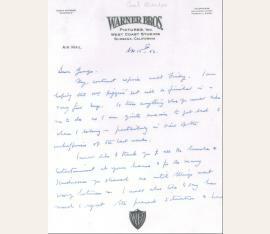 - Each letter on stationery with printed letterhead, including one by Warner Bros.